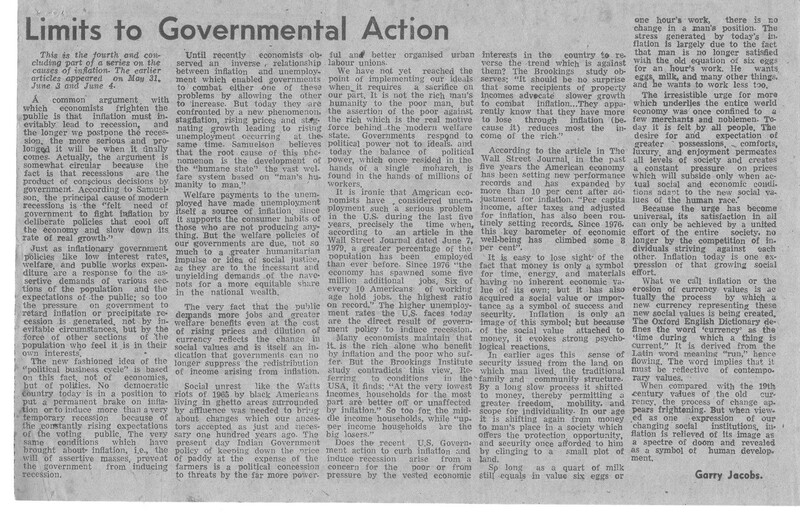 By Garry Jacobs, Published as a four part series in The Hindu in May and June 1980. Click here for the newspaper clipping. The French Revolution, computer sciences, American Civil Rights Movement, automation, credit cards, the Magna Carats, telegraphy, unemployment, literacy, and Indian Freedom, all have one thing in common. They are among the less known, but real, causes of inflation. One of the little recognized virtues of inflation is its role as the only tax on black money and underworld business activities. For several years the reading public all over the world has been bombarded by economists with an array of bleak forecasts, frightening warnings, and prophesies of doom in reference to the worldwide phenomenon of inflation. Some compare our situation with that which spurred the hyperinflation in post World War I Germany. Almost all economists seem to agree that the present inflation is bad or dangerous, though they differ widely regarding the extent of the danger and even more widely as to the proper remedy. When one reviews the current literature on this topic, it is surprising to note just how divergent are the positions of leading economists on questions such as: How can we measure the real rate of inflation? What is the major cause for increasing inflation in the present decade? What will happen if inflation is not stopped? What policies can we implement to stop it and should we implement them or allow it to continue? To illustrate the complexity and divergence of opinion on this issue, a few examples will suffice. No less an authority than John Kenneth Galbraith has described the current inflation as a “revolt of the rich against the poor”. “Economist Richard Parker supports this view with the claim that it is the richest people, the top 7% of the families in terms of wealth that benefit by inflation; while the rest especially the poorest, suffer in proportion to their relative poverty. On the other hand, a conflicting view is contained in a 1979 study published by the Brookings Institute in Washington D.C. This study indicates that the lower or middle classes in the USA are generally benefited or unaffected by inflation, while the upper class is losing. The confusion over who suffers from inflation is extended to other questions as well, including the major causes of inflation. In addition to the traditional proponents of the demand pull, cost push, and monetarist theories, there are many who doubt whether inflation is essentially an economic problem at all. Consultant Konrad Kellen wrote recently in the Los Angeles Times that inflation is not an economic problem but a psychological one, the result of people taking pleasure on spending rather than saving and in earning nominally larger, though in real terms sometimes smaller, incomes. In discussing the contribution of social welfare programs to inflation, Paul Samuelson cites a social factor, the evolution of a more humane society, as a root cause. When the greatest minds of an age examine a problem and fail to arrive at a solution, it must be that the solution is very simple, only they are looking through the wrong end of the telescope. Inflation is one such problem. In an age of scientific precision, we are apt to wonder how there can be so much doubt and confusion over a phenomenon like currency values. We may wonder whether this confusion arises from lack of knowledge, wrong assumptions, too narrow perspective, or even an unwillingness to accept what is obviously true. One thing emerges from the recent literature on this subject; namely, that the causes and effects of inflation cannot be limited to the narrow field of economics, that in order to be fully comprehended inflation must be viewed from a wider or higher level, from a perspective which will reveal all the seemingly divergent facts and conflicting theories as parts of a single phenomenon. In other words, a purely economic explanation of inflation is likely to be as incomplete as a purely physiological description of human behavior. In this article I propose to take a look at inflation from the wider perspective of social evolution which has accompanied the development of our modern economic system. It would be well to start by trying to lift the veil from the “mysterious” causes of inflation. As we shall see the causes are so many and so prominent as to make one wonder whether a non-inflationary currency is even a remote possibility in the foreseeable future. These causes can be divided into major categories. One of the commonly cited causes is the contribution of rising labour costs due to the formidable power of unions to demand annual increments in wage rates. Each rise in labour costs which is not offset by a similar rise in productivity tends to boost the price of the finished products and at the same time to increase the costs of comparable labour everywhere else in the economy. Both of these tendencies are inflationary. The additional wages paid to labour increase their demand for consumer goods putting an upward pressure on prices. Also in the case of manufacturers of consumer goods, profit margins may be reduced by higher costs leaving less profit for reinvestment in greater reduction at a time of increasing demand, another clearly inflationary situation. Under this category of causes we can include all factors which increase the cost of production including labour’s demand for shorter working hours, better working conditions, pensions, medical insurance, etc. The demand of each union for greater benefits initiates a spiral of rising prices that spreads throughout the entire economy and dilutes the value of all currency including labour’s. The marked trend toward decreasing labour productivity in the West has the same effect as rising costs and often occurs in conjunction with it. There is a similar contribution from non-labour resources. The spiraling oil prices are a frequently cited but by no means singular example. Recent government regulations for environmental protection and anti-pollution measures also contribute to inflation while at the same time providing a non-monetary service to the entire community for which it would be difficult to assess the public by direct taxation. Another source of inflation is deficit spending by government. It is often argued that to resort to deficit financing is to enjoy a present benefit at the expense of future generations who must repay what is spent now. But, in fact, the reverse is equally or more true. Deficit spending is a means employed by governments to meet the public’s demand for modern facilities, e.g., new schools and hospitals, better roads, greater military security, welfare support, etc. No present day government can keep up with the demand on the basis of direct taxation alone because there is a gap between what various sections of the public expect and demand on the one hand, and what they are willing to pay for, on the other. This gap is filled by deficit financing. Where this is not possible you have a situation like in New York City where the greatest concentrations of wealth in the world exist along side decaying roads and shrinking city services. When governments issue new currency to cover their expenditure, it acts like a direct tax on all the present holders of currency diluting the value of their holding. It is the one form of taxation that assesses equally both white and black money, legal and illegal business. It is 100% efficient and is collected at no expense to the government. In addition to these well known causes of inflation, there are innumerable others to which little attention has been given. According to monetary theorists, any change in the velocity with which money changes hands will effect prices, increasing velocity having an inflationary effect. Among the non-economic factors which influence velocity are the great strides recently made in increased speed of transportation, communication, banking services, computer credit, etc. Each time the public is offered an improvement in these services, there is a slight increase in the velocity of money transactions and a hidden inflationary effect. In other words, the new service is not only or always paid for directly. There is also an indirect cost which is exacted as dilution of currency values. Similarly, credit card and installment purchases, lease and hire purchase financing increase the total purchasing power in circulation, i.e., increase the total money supply, and thereby tend to raise prices. A parallel effect is associated with the introduction of automation and the reduced dependence on human factors of production. Automation has been widely regarded as anti-inflationary because it increases productivity and reduces production costs. But one effect of modern automation has been the greater organization of labour; and the increasing demands of workers for guaranteed minimum wages, pensions, and unemployment insurance; and expansion of the social security system. In this manner some of the savings in the cost of production arising from automation are passed on to the country at large in the form of inflation. In past centuries expenditures on luxury items was confined to the aristocracy and therefore it had little effect on currency values. But today it has extended to the common man, not only in countries like USA where colour TV sets and big cars have become “essentials” even among the lower classes, but also in developing countries like India where there is a marked trend toward greater expenditure on non-essentials like tourism, festivals, marriages, watches, polyester clothes, stainless steel vessels, cinema, etc. It is easy to understand how the waste of fuel by big American cars is inflationary. It is less obvious that the growing demand for flowers for women’s hair has a similar effect on currency values by bidding up the price of limited materials. In a similar fashion the changing food habits all over the world are resulting in higher prices. In India almost all food items other than those under tight government control have shot up in price during the past ten years. The price of groundnut has increased six times, the price of cashew five times, that of ragi and cumbu three to four times. The increased demand for these items is due to changing social habits and cannot be adequately explained on the basis of population growth or short yielding. The tremendous growth in banking services and credit facilities in India – State Bank of India now has more branches than any other bank in the world – is another contributor to inflation. Greater credit means greater money supply which pushes up prices. So also the greater money flow generated by increased agricultural productivity and industrialization, not only contribute to economic growth, but in conditions of limited supply, to rising prices as well. Spiraling oil prices, powerful labour unions, increasing money supply, deficit financing, consumer debt, high interest rates, etc. are all commonly cited causes of inflation. But as economist Robert Heilbroner has pointed out, inflation existed before many of these factors were present and it persists today in countries where many of them are absent. “No one of these factors can be properly called the single ‘cause’ of ”inflation”. Even if the cumulative effect of all of these factors is measured, it will be found that the current inflation rates exceed the sum of these causes. We must look behind or beyond these myriad symptoms to see if we can identify a central cause which is more universal than any of them and a driving force which is more compelling. Though our study has moved beyond the purely monetary or economic causes of inflation, to consider the contribution of technology welfare, increased consumption, changing tastes, etc., still it has not delved to the level of root causes from which a clear picture can emerge out of our present confusion. We may find a guidepost in statements like this one by Richard Parker, “Domestically, we have experienced not an economic boom after World War II, but a social revolution”. Present day economists study inflation from the viewpoint of the fixed status quo of social values, i.e., the present distribution of resources and wealth in society. But inflation as we know it today is a symptom of a radical transformation in this distribution in favor of the have-nots. 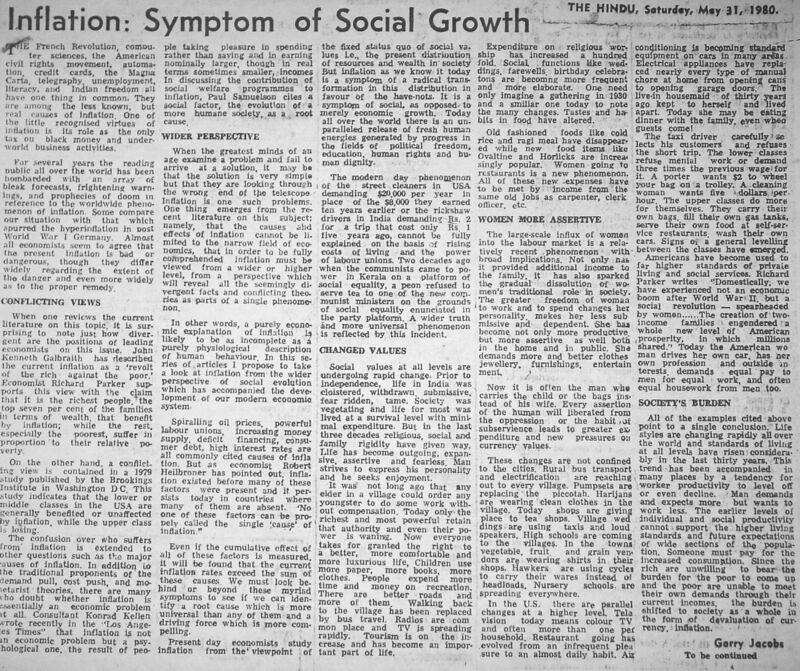 It is a symptom of social, as opposed to merely economic, growth. Today all over the world there is an unparalleled release of fresh human energies generated by progress in the fields of political freedom, education, human rights and dignity, etc. The modern day phenomenon of the street-cleaners in U.S.A. demanding $20,000 per year in place of the $8,000 they earned ten years earlier or the rickshaw drivers in India demanding Rs.2 for a trip that cost only Re.1 five years ago, cannot be explained away on the basis of rising costs of living and the power of labour unions. Two decades ago when the communists came to power in Kerala on a platform of social equality, a peon refused to serve tea to one of the new communist ministers on the grounds of social equality enunciated in the party platform. A wider truth and more universal phenomenon is reflected by this incident. Social values at all levels are undergoing rapid change. Prior to independence, life in India was cloistered, withdrawn, submissive, fear ridden, tame. Society was vegetating and life for most was lived at a survival level with minimal expenses. But in the last three decades religious, social and family rigidity have given way. Life has become outgoing, expansive, assertive, and fearless. Man seeks to express his personality and he seeks enjoyment. It was not long ago that any elder in a village could order any youngster to do some work without compensation. Today only the richest and most powerful retain that authority and even their power is waning. Now everyone takes for granted the right to a better, more comfortable and more luxurious life. Children use more paper, more books, and more clothes. People expend more time and money on recreation, there are better roads and more of them. Walking back to the village has been replaced by bus travel. Radios are common place and TV is spreading rapidly. Tourism is on the increase and has become an important part of life. Expenditure on religious worship has increased a hundred-fold. Social functions like weddings, farewells, birthday celebrations are becoming more frequent and more elaborate. One need only imagine a gathering in 1930 and a similar one today to note the many changes. Tastes and habits in food have altered. The large scale influx of women into the labour market is a relatively recent phenomenon with broad implications. Not only has it provided additional income to the family. It has also sparked the gradual dissolution of women’s traditional role in society. The greater freedom of women to work and to spend changes her personality, makes her less submissive and dependent. She has become not only more productive but more assertive as well, both in the home and in public. She demands more and better clothes, jewelry, furnishings, entertainment, etc. Now it is often the man who carries the child or the bags instead of his wife. Every assertion of the human will liberated from the oppression or the habit of subservience leads to greater expenditure and new pressures on currency values. These changes are not confined to the cities. Rural bus transport and electrification are reaching out to every village. Pump sets are replacing the piccotah. Harijans are wearing clean clothes in the village. Toddy shops are giving place to tea shops. Village weddings are using taxis and loud speakers. High schools are coming to the villages. In the towns, vegetable, fruit, and grain vendors are wearing shirts in their shops. Hawkers are using cycles to carry their wares, instead of head loads. Nursery schools are spreading everywhere. In the U.S. there are parallel changes at a higher level. Television today means colour TV, and often more than one per household. Restaurant going has evolved from an infrequent pleasure to an almost daily habit. Air conditioning is becoming standard equipment on cars in many areas. Electrical appliances have replaced nearly every type of manual chore at home from opening cans to opening garage doors. The line-in housemaid of thirty years ago kept to herself and lived apart. Today she may be eating dinner with the family, even when guests come. The taxi driver carefully selects his customers and refuses the short trip. The lower classes refuse menial work or demand three times the previous wage for it. A porter wants $2 to wheel your bag on a trolley. A cleaning woman wants five dollars per hour. The upper classes do more for themselves. They carry their own bags, fill their own gas tanks, serve their own food at self-service restaurants, and wash their own cars. Signs of a general leveling between the classes have emerged. Americans have become used to far higher standards of private living and social services. 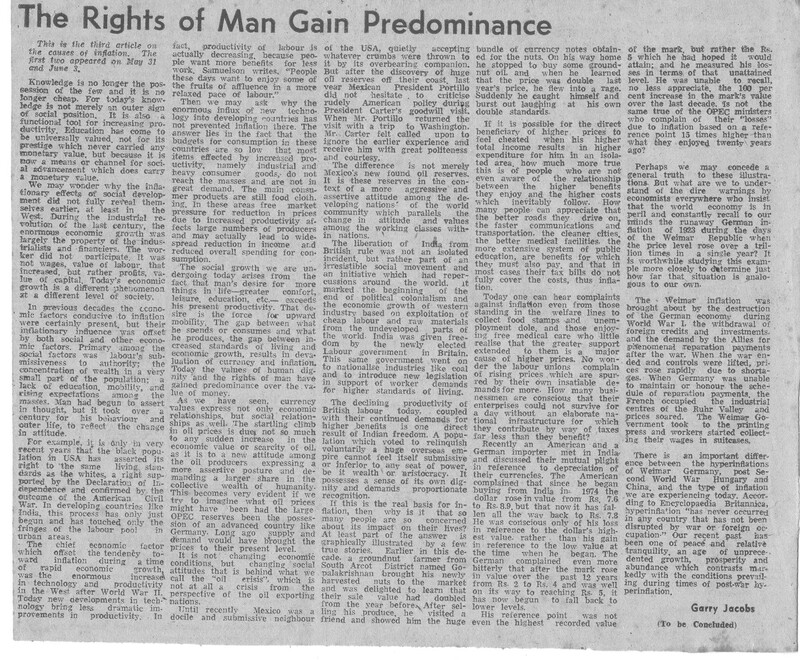 Richard Parker writes, “Domestically, we have experienced not an economic boom after World War II, but a social revolution – spearheaded by women…. The creation of two-income families engendered a whole new level of American prosperity, in which millions shared. Today the American woman drives her own car, has her own profession and outside interests, demands equal pay to men for equal work, and often equal housework from men for no pay. All of the examples cited above point to a single conclusion. Life styles are changing rapidly all over the world and standards of living at all levels have risen considerably in the last thirty years. This trend has been accompanied in many places by a tendency for worker productivity to level off or even decline. Man demands and expects more but wants to work less. The earlier levels of individual and social productivity cannot support the higher living standards and future expectations of wide sections of the population. Someone must pay for the increased consumption. Since the rich are unwilling to bear the burden for the poor to come up and the poor are unable to meet their own demands through their current incomes, the burden is shifted to society as a whole in the form of devaluation of currency, inflation. What modern economists call inflation is nothing other than the evolution of the institution of currency to reflect new social values? The declining value of currency in this decade arises from a correspondingly greater value which is now accorded to other factors of production such as labour, education, oil, etc. It is by no means a new process but it is only in recent years that the process expresses as dramatically changing currency values. Currency is not the only institution to undergo this dramatic change. On the contrary, this process has already made radical alterations in other social institutions like family, religion, education, technology, the role of women, government, etc. The movement of social evolution which expresses today as inflation has its roots in the historical shift from monarchy to democracy which began more than five hundred years ago. In the early centuries of this millennium, power and authority were vested primarily in a feudal system with the monarch at the top surrounded by subservient lords and the peasant at the bottom. Power arose from the land and was determined by one’s birth and blood. Wealth was the possession of the aristocracy by virtue of their authority over the people on the land under their control. The common man lived at subsistence levels receiving a meager share of the harvest, the bulk of which went to the feudal lords. From the viewpoint of currency values, the social position of the king and aristocracy was all powerful. The value of the common man’s labour was defined as the cost of keeping his body and soul together. Not only wealth and power, but education too was almost the exclusive possession of the aristocracy and was valued primarily as a distinguished cultural attainment rather than a practically useful or monetarily valuable possession. 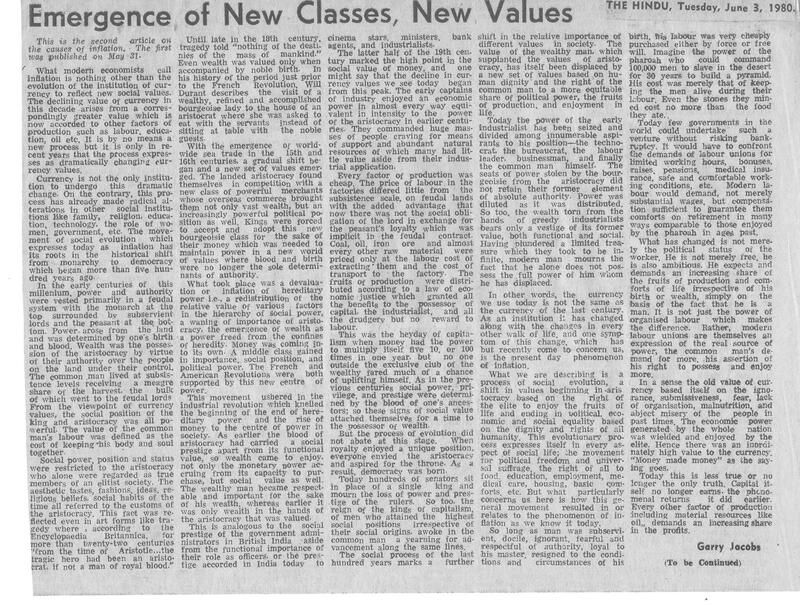 The major exception to this was the clergy whose education had only religious value. Social power, position, status were restricted to the aristocracy who alone were regarded as true members of an elitist society. The aesthetic tastes, fashions, ideas, religious beliefs, social habits of the time all referred to the customs of the aristocracy. This fact was reflected even in art forms like tragedy where, according to the Encyclopedia Britannica, for more than twenty-two centuries “from the time of Aristotle… the tragic hero had been an aristocrat, if not a man of royal blood”. Until late in the 18th century, tragedy told “nothing of the destinies of the mass of mankind”. Even wealth was valued only when accompanied by noble birth. In his history of the period just prior to the French Revolution, Will Durant describes the visit of a wealth, refined and accomplished bourgeoisie lady to the house of an aristocrat where she was asked to eat with the servants instead of sitting at table with the noble guests. With the emergence of worldwide sea trade in the 15th and 16th centuries, a gradual shift began and a new set of values emerged. The landed aristocracy found themselves in competition with a new class of powerful merchants whose overseas commerce brought them not only vast wealth, but an increasingly powerful political position as well. Kings were forced to accept and adopt this new bourgeoisie class for the sake of their money which was needed to maintain power in a new world of values where blood and birth were no longer the sole determinants of authority. What took place was a devaluation or inflation of hereditary power, i.e., a redistribution of the relative value of various factors in the hierarchy of social power, a waning of importance of aristocracy, the emergence of wealth as a power freed from the confines of heredity. Money was coming into its own. A middle class gained in importance, social position, and political power. The French and American Revolutions were both supported by this new centre of power. This movement ushered in the industrial revolution which knelled the beginning of the end of hereditary power and the rise of money to the centre of power in society. As earlier the blood of aristocracy had carried a social prestige apart from its functional value, so wealth came to enjoy, not only the monetary power accruing from its capacity to purchase, but a social value as well. The wealthy man became respectable and important for the sake of his wealth, whereas earlier it was only wealth in the hands of the aristocracy that was valued. This is analogous to the social prestige of the government administrators in British India, aside from the functional importance of their role as officers; or the prestige accorded in India today to cinema stars, ministers, bank agents, and industrialists. Education too gradually escaped from the monopolistic grasp of the nobility and was sought after by the rising middle class which was anxious to imitate all the accomplishments of aristocracy in the hope of converting money, which still carried a stigma of lower origins, into blood. Still education had little value in its own right except as an outer sign of one’s other claims to respectability. The latter half of the 19th century marked the high point in the social value of money, and one might say that the gradual decline in currency values began from this peak. The early captains of industry enjoyed an economic power in almost every way equivalent in intensity to the power of the aristocracy in earlier centuries. They commanded at will huge masses of people craving for means of support and abundant natural resources of which many had little value aside from their industrial application. Every factor of production was cheap. The price of labour in the factories differed little from the subsistence scale on feudal lands with the added advantage that now there was not the social obligation of the lord in exchange for the peasant’s loyalty which was implicit in the feudal contract. Coal, oil, iron ore and almost every other raw material were priced only at the labour cost of extracting them and the cost of transport to the factory. The fruits of production were distributed according to a law of economic justice which granted all the benefits to the possessor of capital, the industrialist, and all the drudgery but no reward to labour. This was the heyday of capitalism when money had the power to multiply itself 5, 10, or 100 times in single year, but no one outside the exclusive club of the wealthy fared much of a change of uplifting himself. As in the previous centuries social power, privilege, and prestige was determined by the blood of one’s ancestors; so these signs of social value attached themselves for a time to the possessor of wealth. But the process of evolution did not abate at this stage. When royalty enjoyed a unique position everyone envied the aristocracy and aspired for the throne. As a result, democracy was born. Today hundreds of senators sit in place of a single king and mourn the loss of power and prestige of the rulers. So too, the reign of the kings of capitalism, of men who attained the highest social positions irrespective of their social origins, awoke in the common man a yearning for advancement along the same lines. The social process of the last hundred years marks a further shift in the relative importance of different values in society. The value of the wealthy man, which supplanted the values of aristocracy, has itself been displaced by a new set of values based on human dignity and the right of the common man to a more equitable share of political power, the fruits of production, and enjoyment in life. Today the power of the early industrialist has been seized and divided among innumerable aspirants to his position – the technocrat, the bureaucrat, the labour leader, businessman, and finally the common man himself. The seats of power stolen by the bourgeoisie from the aristocracy did not retain their former element of absolute authority. Power was diluted as it was distributed. So too, the wealth torn from the hands of greedy industrialists bears only a vestige of its former value, both functional and social. Having plundered a limited treasure which they took to be infinite, modern man mourns the fact that he alone does not possess the full power of whom he has displaced. In other words, the currency we use today is not the same as the currency of the last century. As an institution it has changed along with the changes in every other walk of life, a one symptom of this change, which has but recently come to concern us, is the present day phenomenon of inflation. What we are describing is a process of social evolution, a shift in values beginning in aristocracy based on the right of the elite to enjoy the fruits of life and ending in political, economic and social equality based on the dignity and rights of all humanity. This evolutionary process expresses itself in every aspect of social life; the movement for political freedom and universal suffrage, the right of all to food, education, employment, medical care, housing, basic comforts, etc. But what particularly concerns us here is how this general movement results in or relates to the phenomenon of inflation as we know it today. So long as man was subservient, docile, ignorant, fearful and respectful of authority, loyal to his master, resigned to the conditions and circumstances of his birth, his labour was very cheaply purchased either by force or free-will. Imagine the power of the pharaoh who could command 100,000 men to slave in the desert for 30 years to build a pyramid. His cost was merely that of keeping the men alive during their labour. Even the stones they mined cost no more than the food they ate. Today few governments in the world could undertake such a venture without risking bankruptcy. It would have to confront the demands of labour unions for limited working hours, bonuses, raises pensions, medical insurance, safe and comfortable working conditions, etc. Modern labour would demand not merely subsistence wages, but compensation sufficient to guarantee them comforts on retirement in many ways comparable to those enjoyed by the pharaoh in ages past. What has changed is not merely the political status of the worker. He is not merely free, he is also ambitious. He expects and demands and increasing share of the fruits of production and comforts of life, irrespective of his birth or wealth, simply on the basis of the fact that he is a man. It is not just the power of organized labour which makes the difference. Rather, modern labour unions are themselves an expression of the real source of power, man’s demand for more, his assertion of his right to possess and enjoy more. In a sense the old values of currency based itself on the ignorance, submissiveness, fear, lack of organization, malnutrition, and abject misery of the people in past times. The economic power generated by the whole nation was wielded and enjoyed by the elite. Hence there was an inordinately high value to the currency. “Money made money” as the saying goes. Today this is less true or no longer the only truth. Capital itself no longer earns the phenomenal returns it did earlier. Every other factor of production including material resources like oil, demands an increasing share in the profits. Knowledge is no longer the possession of the few and it is no longer cheap. For today’s knowledge is not merely an outer sign of social position. It is also a functional tool for increasing productivity. Education has come to be universally valued, not for its prestige which never carried any monetary value, but because it is now a means or channel for social advancement which does carry a monetary value. As education spreads, the lower levels of each profession are filled in by more educated men. Today in some large Indian corporations the checks are written by auditors whereas in earlier decades one auditor supervised the work of a hundred clerks. In Cuddalore where there were only 4 or 5 diploma holders and 1 or 2 degree holders in medicine, now there are 30 or 40 degree holders and 10 MD’s. The diploma, a lesser qualification, has been abolished. Now that greater talent is available at lower levels, service is higher in quality. Cost also is higher. This is a step forward in civilization, but someone has to pay for the ungraded service. If the community is not consciously willing, it is paid for indirectly through inflated currency values. Now education has a statue. What educated people demand today may no longer be in proportion to their productivity. Where their new demands exceed increases in their productivity, inflationary pressure is generated. Today almost every educated man feels he is entitled to a level of income which is greater than what he is presently enjoying. As in earlier centuries society conceded social value to the aristocrat for the sake of his blood and the wealthy for the sake of his gold, today it is conceded to the educated man for the sake of his education; and, to a less or extent, to every man simply because he is a member of society. We may wonder why the inflationary effects of social development did not reveal themselves more fully earlier at least in the West. During the industrial revolution of the last century, the enormous economic growth was largely the property of the industrialists and financiers. The worker did not participate. It was not wages, value of labour, that increased, but rather profits, value of capital. Today’s economic growth is a different phenomenon at a different level of society. In previous decades the economic factors conducive to inflation were certainly present, but their inflationary influence was offset by both social and other economic factors. Primary among the social factors was labour’s submissiveness to authority; the concentration of wealth in a very small part of the population; a lack of education, mobility, and rising expectations among the masses. Man had begun to assert in thought, but it took over a century for his behavior, outer life, to reflect the change in attitude. For example, it is only in very recent years that the black population in USA has asserted its right to the same living standards as the whites and initiated the process by which the last vestiges of the old labour-employer values are being transformed. In developing countries like India, this process has only just begun and has touched only the fringes of the labour pool in urban areas. The chief economic factor which offset the tendency toward inflation during a time of rapid economic growth was the enormous increase in technology and productivity in the West after World War II. Today new developments in technology bring less dramatic improvements in productivity. In fact, productivity of labour is actually decreasing, because people want more benefits for less work. Samuelson writes, “People these days want to enjoy some of the fruits of affluence in a more relaxed pace of labour”. Then we may ask why the enormous influx of new technology into developing countries has not prevented inflation there. The answer lies in the fact that the budgets for consumption in these countries are so low that most items effected by increased productivity, namely industrial and heavy consumer goods, do not reach the masses and are not in great demand. The main consumer products are still food and clothing. In these areas free market pressure for reduction in prices due to increased productivity effects large numbers of producers and may actually lead to widespread reduction in income and reduced overall spending for consumption. The social growth we are undergoing today arises from the fact that man’s desire for more things in life – greater comfort, leisure, education, etc. – exceeds his present productivity. That desire is the force for upward mobility. The gap between what he spends or consumes and what he produces, the gap between increased standards of living and economic growth, results in devaluation of currency, inflation. Today the values of human dignity and the rights of man have gained predominance over the value of money. As we have seen, currency values express not only economic relationships, but social relationships as well. The startling climb in oil prices is due not so much to any sudden increase in the economic value or scarcity of oil, as it is to a new attitude among the oil produces expressing a more assertive posture and demanding a larger share in the collective wealth of humanity. This becomes very evident if we try to imagine what oil prices might have been had the large OPEC reserves been the possession of an advanced country like Germany. Long ago supply and demand would have brought the prices to their present level. It is not changing economic conditions, but changing social attitudes that is behind what we call the “oil crisis”, which is not at all a crisis from the perspective of the oil exporting nations. Until recently Mexico was a docile and submissive neighbor of the USA, quietly accepting whatever crumbs were thrown to it by its overbearing companion. But after the discovery of huge oil reserves off their coast, last year Mexican President Portillo did not hesitate to rudely criticize American policy during President Carter’s goodwill visit. When President Portill returned the visit by a trip to Washington, President Carter felt called upon to ignore the earlier experience and receive him with great politeness and courtesy. The difference is not merely Mexico’s new found oil reserves. It is these reserves in the context of a more aggressive and assertive attitude among the developing nations of the world community which parallels the change in attitude and values among the working classes within nations. The liberation of India from British rule was not an isolated incident, but rather part of an irresistible social movement and an initiative which had repercussions around the world. It marked the beginning of the end of political colonialism, and the economic growth of western industry based on exploitation of cheap labour and raw materials from the undeveloped parts of the world. India was given freedom by the newly elected Labour government in Britain. This same government went on to nationalize industries like coal and to introduce new legislation in support of worker demands for higher standards of living. The declining productivity of British labour today, coupled with their continued demands for higher benefits, is one direct result of Indian freedom. A population which voted to voluntarily relinquish a huge overseas empire cannot feel itself submissive or inferior to any seat of power, be it wealth or aristocracy. It possesses a sense of its own dignity and demands proportionate recognition. If this is the real basis for inflation, then why is it that so many people are so concerned about its impact of our lives? At least part of the answer is graphically illustrated by a few true stories. Earlier in this decade a groundnut farmer from South Arcot District named Gopalakrishnan brought his newly harvested nuts to the market and was delighted to learn that their sale value had doubled from the year before. After selling his produce, he visited a friend and showed him the huge bungle of currency notes obtained for the nuts. On his way home he stopped to buy some groundnut oil, and when he learned that the price was double last years price, he flew into a rage. Suddenly he caught himself and burst out laughing at his own double standards. If it is possible for the direct beneficiary of higher prices to feel cheated when his higher total income results in higher expenditure for him in an isolated area, how much more true this is of people who are not even aware of the relationship between the higher benefits they enjoy and the higher costs which inevitably follow. How many people can appreciate that the better roads they drive on, the faster communications and transportation, the cleaner cities, the better medical facilities, the more extensive system of public education, are benefits for which they must also pay, and that is most cases their tax bills do not fully cover the costs, thus inflation. Today one can hear complaints against inflation even from those standing in the welfare lines to collect food stamps and unemployment dole, and those enjoying free medical care, who little realize that the greater support extended to them is a major cause of higher prices. No wonder the labour unions complain of rising prices which are spurred by their own insatiable demands for more. How many businessmen are conscious that their enterprises could not survive for a day without an elaborate national infrastructure for which they contribute by way of taxes far less than they benefit? Recently an American and German importer met in India and discussed their mutual plight in reference to depreciation of their currencies. The American complained that since he began buying from India in 1974 the dollar rose in value from Rs.7.6 to Rs.8.9, but that now it has fallen all the way back to Rs.7.8. He was conscious only of his loss in reference to the dollars highest value, rather than his gained in reference to the low value at the time when he began. The German complained even more bitterly that after the mark rose in value over the past twelve years from Rs.2 to Rs.4 and was well on its way to reaching Rs.5, it has now begun to fall back to lower levels. His reference point was not even the highest recorded value of the mark, but rather the Rs.5 which he had hoped it would attain; and he measured his losses in terms of that unattained level. He was unable to recall, no less appreciate, the 100% increase in the mark’s value over the last decade. Is not the same true of the OPEC ministers who complain of their “losses” due to inflation based on a reference point 15 times higher than what they enjoyed twenty years ago? Perhaps we may concede a general truth to these illustrations. But what are we to understand of the dire warnings and tears shed by economists everywhere who insist that the world economy is in peril and constantly recall to our minds the runaway German inflation of 1923 during the days of the Weimar Republic when the price level rose over a trillion times in a single year? It is worthwhile studying this example more closely to determine just how far that situation is analogous to our own. The Weimar inflation was brought about by the destruction of the German economy during World War I the withdrawal of foreign credits and investments, and the demand by the Allies for phenomenal reparation payments after the war. When the war ended and controls were lifted, prices rose rapidly due to shortages. When German was unable to maintain honor the schedule of reparation payments, the French occupied the industrial centres of the Ruhr Valley and prices soared. The Weimar government took to the printing press and workers started collecting their wages in suitcases. There is an important difference between the hyper-inflations of Weimar Germany, post Second World War Hungary and China, and the type of inflation we are experiencing today. According to Encyclopedia Britannica, hyper-inflation “has never occurred in any country that has not been disrupted by war or foreign occupation”. Our recent past has been one of peace and relative tranquility, an age of unprecedented growth, prosperity and abundance which contrasts markedly with the conditions prevailing during times of post-war hyper-inflation. A common argument with which economists frighten the public is that inflation must inevitably lead to recession and the longer we postpone the recession, the more serious and prolonged it will be when it finally comes. Actually, the argument is somewhat circular because the fact is that recessions are the products of conscious decisions by government. According to Samuelson, the principle cause of modern recessions is the “felt need of government to fight inflation by deliberate policies that cool off the economy and slow down its rate of real growth”. Just as inflationary government policies like low interest rates, welfare and public works expenditure are a response to the assertive demands of various sections of the population and the expectations of the public; so too the pressure on government too retard inflation or precipitate recession is generated, not by inevitable circumstances, but by the force of other sections of the population who feel it is in their own interests. The new fashioned idea of the “political business cycle” is based on this fact, not of economic, but of politics. No democratic country today is in a position to put a permanent brake on inflation or to induce more than a very temporary recession because of the constantly rising expectations of the voting public. The very same conditions which have brought about inflation, i.e., the will of assertive masses, prevent the government from inducing recession. Until recently economists observed an inverse relationship between inflation and unemployment which enabled government to combat either one of these problems by allowing the other to increase. But today they are confronted by a new phenomenon, stagflation, which seems to contradict this earlier principle, rising prices and stagnating growth leading to rising unemployment occurring at the same time. Samuelson believes that the root cause of this phenomenon is the development of the “human state”, the vast welfare system based on “man’s humanity to man”. Welfare payments to the unemployed have made unemployment itself a source of inflation, since it supports the consumer habits of those who are not producing anything. But the welfare policies of our governments are due, not so much to a greater humanitarian impulse or idea of social justice, as they are to the incessant and unyielding demands of the have-nots for a more equitable share in the national wealth. The very fact that the public demands more jobs and greater welfare benefits even at the cost of rising prices and dilution of currency reflects the change in social values and is itself an indication that governments can no longer suppress the redistribution of income arising from inflation. Social unrest like the Watts riots of 1965 by black Americans living in ghetto areas surrounded by affluence was needed to bring about changes which our ancestors accepted as just and necessary one hundred years ago. The present day Indian Government policy of keeping down the price of paddy at the expense of the farmers is a political concession to threats by the far more powerful and better organized urban labour unions. We have not yet reached the point of implementing our ideals when it requires a sacrifice on our part. It is not the rich man’s humanity to the poor man, but the assertion of the poor against the rich which is the real motive force behind the modern welfare state. Governments respond to political power not to ideals, and today the balance of political power, which once resided in the hands of a single monarch, is found in the hands of millions of workers. It is ironic that American economists have considered unemployment such a serious problem in the US during the late five years, precisely the time when, according to an article in the Wall Street Journal, date June 7, 1979, a greater percentage of the population has been employed than ever before. Since 1976 “the economy has spawned some five million additional jobs. Six of every 10 Americans of working age hold jobs, the highest ration on record”. The higher unemployment rates the US faces today are the direct result of government policy to induce recession. Many economists maintain that it is the rich alone who benefit by inflation and the poor who suffer. But the Brookings Institute study contradicts this view. Referring to conditions in the USA, it finds: “At the very lowest incomes, households for the most part are better off or unaffected by inflation”. So too for the middle income households, while “upper incomes households are the big losers”. Does the recent US government action to curb inflation and induce recession arise from a concern for the poor or from pressure by the vested economic interests in the country to reverse the trend which is against them? The Brookings study observes: “It should be no surprise that some recipients of property incomes advocate slower growth to combat inflation…. They apparently know that they have more to lose through inflation (because it) reduces most the income of the rich”. According to an article in The Wall Street Journal of June 7, 1979, in the past five years the American economy has been setting new performance records and has expanded by more than 10% after adjustment for inflation. “Per capital income, after taxes and adjusted for inflation, has also been routinely setting records. Since 1976, this key barometer of economic well-being has claimed some 8%”. It is easy to lose sight of the fact that money is only a symbol for time, energy and materials having no inherent economic value of its own. But it has also acquired a social value or importance as a symbol of success and security. Inflation is only an image of this symbol, but because of the social value attached to money it evokes strong psychological reactions. In earlier ages this sense of security issued from the land on which man lived, the traditional family and structure. By a long slow process it shifted to money, thereby permitting a greater freedom, mobility, and scope for individuality. In our age it is shifting again from money to man’s place in a society which offers the protection, opportunity, and security once afforded to him by clinging to a small plot of land. So long as a quart of milk still equals in value six eggs or one hour’s work, there is no change in a man’s position. The stress generated by today’s inflation is largely due to the fact that man is no longer satisfied with the old equation of six eggs for an hour’s work. He wants eggs, milk, and many other things, and he wants to work less too. The irresistible urge for more which underlies the entire world economy was once confined to a few merchants and noblemen. Today it is felt by all people. The desire for and expectation of greater possessions, comforts, luxury, and enjoyment permeates all levels of society and creates a constant pressure on prices which will subside only when actual social and economic conditions adapt to the new social values of the human race. Because the urge has become universal, its satisfaction in all can only be achieved by a united effort of the entire society, no longer by the competition of individuals striving against each other. Inflation today is one expression of that growing social effort. What we call inflation or the erosion of currency values is actually the process by which a new currency representing these new social values is being created… The Oxford English Dictionary defines the word ‘currency’ as the “time during which a thing is current”. It is derived from the Latin word meaning “run”, hence flowing. The word implies that it must be reflective of contemporary values. When compared with the 19th century values of the old currency, the process of change appears frightening. But when viewed as one expression of our changing social institutions, inflation is relieved of its image as a specter of doom and revealed as a symbol of human development.